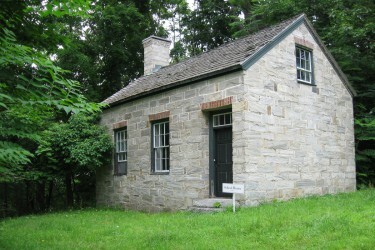 This stone schoolhouse was built between 1826 and 1828 by John Jay and his son William for William’s young children. The building was first used as a schoolhouse, then as a children’s playhouse. In the 1930s, Eleanor Jay Iselin loaned the building to the author Frederick Schiller Faust who wrote under the pen name Max Brand. He wrote one of his Western novels here. Today, the schoolhouse is one of our Discovery Centers, where children can learn what school days were like long ago.